Oboe, violin, viola and cello. 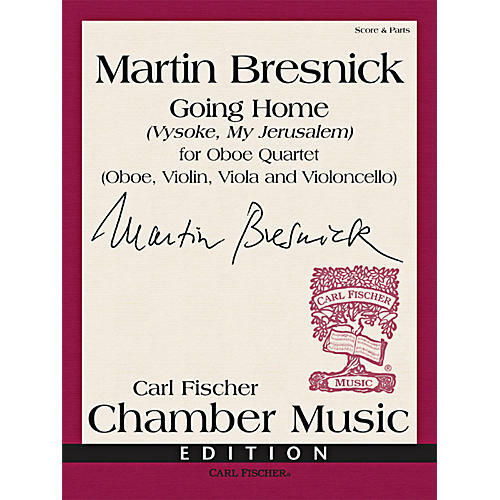 Martin Bresnick began playing the oboe at the age of eleven and performed seriously throughout graduate school, and was delighted to be invited to write an oboe quartet for the group Double Entendre. It became an unexpected journey into his family's past. From the composer: "Delighted to receive a commission to write an oboe quartet for Double Entendre, I was pleased at the thought I would find myself ˜Going Home' (with a glancing reference to the great English horn melody of Dvor¡k); I intended to take a gentle musical journey back to my youthful studies and beloved instrument. Instead, without willing it, I was taken back to childhood memories of my mother and my grandparents; to their songs and stories of ˜Vysoke Litovsk,' the small Russian-Polish (now Belarussian) town where they and my ancestors had lived for many generations. I was taken back to memories of my own visit to Vysoke in 1995. Just as my mother and grandparents remembered, I found the dense birch and pine forests, the small railway station and the Potocki estate. The Catholic Church, just being restored, stood not far from the brilliant blue and gold-onion domes of the Orthodox Church. And, as they remembered, the Pulwa river (a tributary of the Bug river) ran beside the lunke or meadow. Goats and horses were grazing there, tethered to the green grass. The ruined synagogue, at the edge of the meadow, was just a short distance down an unpaved dirt road that led to a small wooden house, once the home of my family." For advanced players. Order today and journey to the homeland with the composer.